Monik Sioui may not be a household name, but this woman dedicated much of her time and energy to improving the lives of Aboriginal women and children. Sioui was born in Huron Village, now Wendake, Que., in 1951. Her father was Huron and her mother was Abenaki, and she grew up in the Abenaki community of Odanak. Sioui first began her work in the early 1970’s at Thunderbird Press, the first Native-owned and operated print shop in Canada. The print shop was part of the newly-opened Native North American Studies Institute and was responsible for producing curriculum materials. When the institute became Manitou Community College, the print shop became a hot-bed of Indian politics. At the time, Native people were eager to take a stand to protect Aboriginal rights. They fought to have their stories told. In addition to printing text books, children's books and books of poetry, the print shop produced two newspapers, one in English and one in French. Sioui taught at the college. One day when a respected Elder came to the school to speak to students and began talking about the importance of oral tradition, rejecting the written word, Sioui took him to the print shop to show him what was being produced. Even her respect for the Elder wasn't going to dampen her enthusiasm for the printed word as a tool to enhance education and the lives of Aboriginal people. In addition to teaching and working at the press, Sioui worked on curriculum development and sat on the college's board of governors. But it was not to last. Within three years, the department of Indian Affairs closed the school. Sioui wanted to become involved in Indian politics, but had problems breaking into the male-dominated Native provincial organizations that existed. As a result, Sioui joined with other like-minded women and, in 1974, founded the Quebec Native Women's Association. Sioui was president and during that time she led the first investigation in Canada into the adoption of Indian children by non-Indian families. In the early days of the organization, before the association even had an office, Sioui would drive around the province, visiting Aboriginal communities and talking to them about limitations of the Indian Act. While many people felt the act was cast in stone, unchangeable, she would talk to them and explain how things could, and must, be changed. That took Sioui to the national scene. She was involved in the 1979 women's march from Kanehsatake to Ottawa that brought attention to the inequity of Section 12 (1)(b) of the Indian Act. Under this section, women who married non-status men lost their status, and so did the children produced by those marriages. Sioui was one of the women who gained the ear of then-prime minister Joe Clark and his wife Maureen McTeer, who sat down with the protesters on the grass as they neared Ottawa and listened to what they had to say. Although Clark, who had just become prime minister the month before, assured the women he would do something to change the situation, his tenure as prime minister didn't last long enough for him to keep his word. In March 1980, he was out and Pierre Elliot Trudeau was back in power. Sioui then helped take the issue to an international forum. She was part of the delegation that attended the Fourth Russell Tribunal in the Hague in 1980. The tribunal, organized by the Dutch Workgroup Indian Project and the Bertrand Russell Peace Foundation in England, was examining the rights of the Aboriginal people of North America. Sioui spoke at the forum about the Indian Act's discrimination against Aboriginal women. Thanks to the efforts of Sioui and many others from across the country, the Indian Act was amended under Bill C-31. The next big challenge for Sioui came in 1980, when she was working for Indian Affairs in Montreal. In Val-d'Or, work had begun to resurrect the Algonquin Council, and the department loaned Sioui to the council for a year to help them establish their offices. She never returned to the department. Instead she relocated to Val-d'Or to start a new chapter in her life and turn her efforts to another cause. When she came to work with the council, she met Richard Kistabish. The couple had two children together, a girl, Wanaki, and a boy, Menoe, two younger siblings for Sioui's son, Patrik, who was born years before and was with his mother through all her earlier work. Because the Abenaki people had almost completely lost their language, Sioui was concerned for the Algonquins. She pushed them to work to maintain their language and way of life. When her two younger children were born, she showed her respect for the language by giving them both Algonquin names. While working with the council, Sioui and Kistabish began to work with two friends who were doctors, looking into the living conditions in Kitcisakik, a small community about 65 km south of Val-d'Or. Kitcisakik didn't have legal reserve status, and had no permanent homes in the community. They set up the Kitcisakik Welfare Society to deliver health and social services there, and Sioui, concerned about the level of violence and sexual abuse women and children in the community were enduring, began to tackle that problem. One woman at a time, one child at a time, she worked to find a way to stop the abuse. She worked with the perpetrators, and helped set up a network of organizations that would provide services to the people there. She worked for 15 years in northern Quebec, giving not only her time and energies, but also her love. It was her way to make sure a day didn't go by without her telling someone she loved them, whether it be a member of her family or a person she was working to help. And she encouraged the people in the communities she worked with to do the same, to say 'I love you' to their children, their parents, their grandparents. Sioui continued her work well into the 1990s. Then, after feeling tired all the time for more than a year, she found out she had cancer. In October 1997, she and Kistabish married. A week later she was gone. In December 1998, Quebec's Commission des droits de la personne et des droits de la jeunesse awarded Sioui the Prix Droits et Libertés (the Rights and Liberties Prize) in recognition of the work she had done to restore social health to Aboriginal communities in the province. While Sioui put much time and energy into the work she did, those closest to her remember her more for who she was than for what she accomplished. They remember her humor, her determination, her strength and her love. They remember her as a woman who had many friends and who touched many lives, who encouraged everyone to do the best that they could, be the best that they could, and then do better yet. 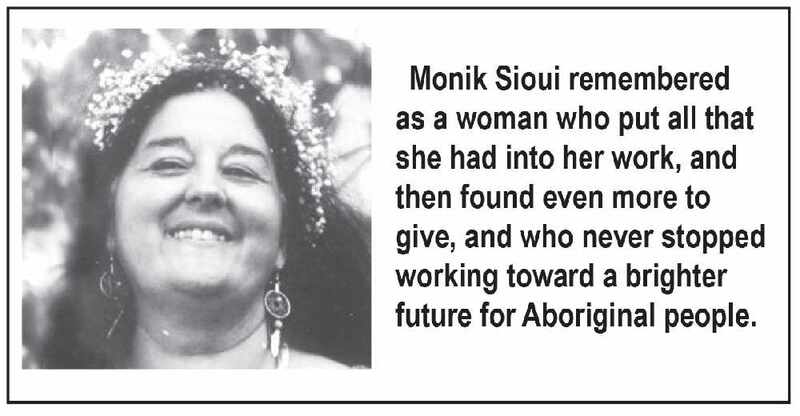 They remember Sioui as a woman who put all that she had into her work, and then found even more to give, and who never stopped working toward a brighter future for Aboriginal people.